A group of students forced their way into the Guildhall in Londonderry on Friday as part of a protest against the rise in university tuition fees. The protestors left the council chamber after about five minutes. About 300 people attended the protest, which began at about 1200 GMT on Friday. Many of those taking part were sixth-form students. Teachers and local councillors also attended the protest. The group was addressed by civil rights campaigner Eamonn McCann. The demonstration was organised on social networking websites. Hannah McKinney is at St Cecilia's College in Derry. "I'm here today for the same reason as everybody else, I want to go to university. "My future's in jeopardy and I want to make a difference." 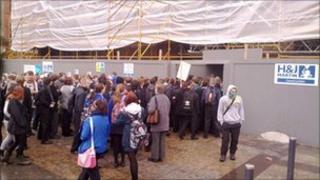 The mayor of Derry, Colum Eastwood, who was also at the protest, said the students left the Guildhall peacefully. "I personally support people's right to protest, in fact I support their cause, and Derry City Council supports them as well. "Calmer heads prevailed and they realised they were pushing against an open door in the Guildhall and moved on." On Thursday the government voted by 323 MPs to 302 to raise fees at English universities to between £6,000 and £9,000 per year. Image caption Many of the protestors are local sixth-formers. Meanwhile two men aged 19 and 23, have been charged with public order offences after a Belfast protest against plans to raise third level tuition fees. They are due to appear in Belfast Magistrates' Court in January. In total, six men and two women were arrested for public order offences. Six people have been released pending reports. Three of those arrested are under 18 years old. Another man arrested at the protest has been charged with possessing drugs with intent to supply. Police moved in on Thursday as about 30 young people sat down and blocked Donegall Square North outside Belfast City Hall.